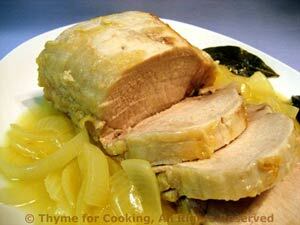 Roast Pork Loin with Mustard Onions, Thyme for Cooking easy gourmet dinners. We'll use 8 - 12oz of pork in the Lo Mein on Monday, if you have more than that leftover, have it for lunch. Use the leftover Tomato Sauce from Friday - along with the reserved tomato juice; reduce it slightly when reheating if needed, to thicken. Use white button or brown cremini for this. If you want to use the larger portabella (not available here) you will probably only want to do 2 or 4, depending on size. Finely chop the shallots and mince garlic. Add mushroom caps and sauté until light brown, 3 - 4 minutes, turning once. Add garlic and shallots to pan and sauté until tender, about 5 minutes. In small bowl mix yogurt, shredded cheese, herbs and crumbs. Add shallots and garlic and mix well. Spoon mixture into mushroom caps, dividing evenly. Sprinkle with Parmesan. Bake in 375F (180C) oven for 10 minutes, until they are light brown. To finish: Heat tomato sauce in a small saucepan just until warm. When mushrooms are done remove from oven. Spoon some tomato sauce onto the bottom of 2 small plates. 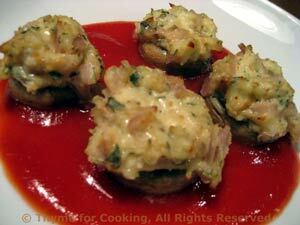 Divide the mushrooms and arrange on sauce. Serve. Note: If liquid accumulates in the caps before stuffing, stir it into the shallot mixture. I've been making these for a long time. I think the original idea came from a Williams-Sonoma book. Once flipped, the heat can be reduced a bit and they can cook slowly with no attention, if needed. Heat oil in medium nonstick skillet over medium heat. Add leeks and sauté until softened, about 5 minutes. While the leeks sauté wash the potatoes and shred using the large holes on the box grater. 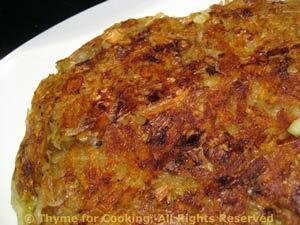 Put the shredded potatoes into a bowl, add the cooked leeks and stir to combine. Melt the butter in the same skillet. Add the potato/leek mixture, flatten as best you can with a spatula, cover and cook over medium heat about 10 minutes, or until potatoes are golden - take a peak around the edges. Put a plate (or tray) on top of the skillet. Grabbing the plate and skillet together (with hot pads) flip them over so that the cake is on the plate. Slide the cake back into the pan to cook the other side, another 7 - 10 minutes, but don't cover. When done, slide onto a plate, sprinkle with salt and pepper, cut into wedges and serve. I got the idea for this in a Williams Sonoma cookbook. Honey could be used instead of the Brown sugar. The color is a bit odd but the flavor is wonderful! Peel carrots, and cut into rounds about 1/4" (.6cm) thick. 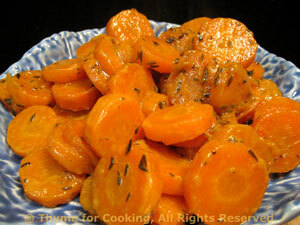 Put carrots and water into a small saucepan or nonstick skillet. Bring to a simmer over medium heat. Reduce heat and let simmer until done, 10 - 15 minutes. Drain carrots and return empty pan to heat. Add stock, brown sugar, thyme and mustard and stir until sugar is melted. Add carrots and stir, over high heat until glaze is thick and hot. Serve.